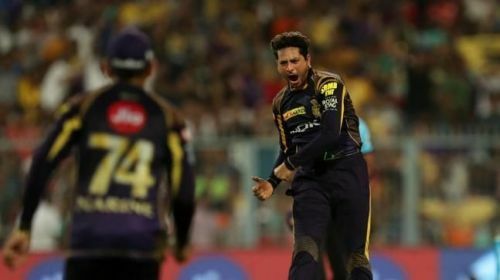 In an exclusive chat on Sportskeeda's #MindVoice, Kolkata Knight Riders spinner Kuldeep Yadav spoke about Gambhir's captaincy at KKR, the best tips he has received, and more. Here's Part-2 of the interaction. 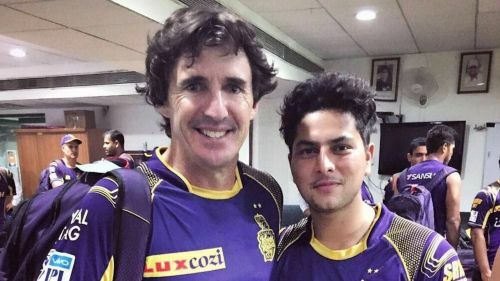 Your thoughts on the 'bromance' with Gautam Gambhir at KKR? Amazing player! He was brilliant when he was leading the KKR team. He was the one who always backed the youngsters. He was the one who told me - "Tera time aayega khelne ka" (your time will come to play). You're bowling really well, just keep focussing on small things and stick to the basics. Don't try too much". "Tera time aayega, tu khelega. Main khilaunga tujhe". (Your time will come, you'll play. I will give you a chance). "Gambhir has always backed me"
When I got the chance, he just said, "Tu pura match khelega" (you'll play the whole match). 'Don't worry about the performance, just show what you have got'. He has always been there for me. What he has done for Kolkata Knight Riders is unbelievable. He always backed me, even in the nets, he used to keep telling me how I was bowling, how the batsman was reacting and what to bowl. I improved considerably from there. What kind of an influence has Mike Horn (Team Motivator at KKR) been on you? He is a class-act, amazing as a person. He's just phenomenal, he keeps motivating youngsters among the group, and also the seniors. He has shared every experience that he has had over the course of his career, and life. A few days back, I spoke to him, and he was very happy with my progress. He will probably come for the IPL as well. It's a great feeling to have him in the KKR squad. What is the best advice Shane Warne ever gave you? He told me to just keep smiling, because if you smile you are releasing all the pressure and nervousness. It's a small but very important thing. Tricks you learned from Brad Hogg? Wrong'uns. The way he bowled the wrong ones was amazing. He was very quick through the air. Thoughts on the upcoming IPL. How important is it ahead of the World Cup? IPL is totally different, it's the toughest league I have played in. You tend to be under pressure in some situations. It will always be challenging, and it will be good to play it before the World Cup.